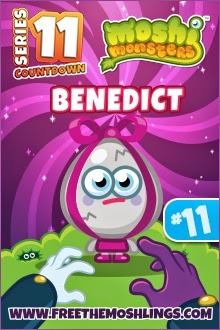 Here we are today to introduce you to Benedict the Broken Booble in today's Moshling Countdown. Benedict LOVES gift wrap. But he really doesn't like teaspoons! Broken Boobles just about manage to hold themselves together because they are constantly cracking up. That’s why these eggy Moshlings use colourful ribbons to prevent their fragile heads from falling to bits. Unfortunately their arms are so short they are forever asking passers-by to help tie their bows. Habitat: Broken Boobles hang out alongside Boiled Boffins in Yellow Middle Meadow, but they also enjoy chilling out in eggcups on Beaster Island. Likes: Rolling down hills and gift wrapping. Dislikes: Teaspoons and Potty Pipsqueaks. Come back tomorrow to see which moshling is being revealed next. The best blogging assignment ever!